Geetings! Janet Tokerud here. I am the founder and architect of Studio Manager and this is our Studio Manager product site. We’ve been working with the creative services sector for close to three decades. We used to build custom systems for these clients, one at a time, before creating Studio Manager as a product. We are the exception to the rule among competing providers in the creative services systems sector. One of us is a designer (Kathy Scout Tomyris) and one a FileMaker expert who works with lots of creatives (Janet). Scout also does a lot of FileMaker for us both on the product and in customizing Studio Manager for individual customers. Right now, Scout as chief designer has just finished work on our most recent update: Studio Manager 16. Sally Shannon also helps out on Studio Manager in the marketing, testing and layout work. We have a lot of layout work around here because every time FileMaker updates, something better becomes possible in terms of the user interface. You can see more about our whole company at tokerud.com where I blog about the state of Apple’s ecosystem every few months. Here’s our contact info. You’ll need FileMaker Pro 16 or 15 (although 14 will do) to Run Studio Manager 16. On the Mac side, choose an iMac, Mac Pro, Mac mini or MacBook Pro that was released in 2012 or later that has been upgraded to at least MacOS 10.11 (El Capitan). More current versions of the MacOS are recommended: 10.12 Sierra or 10.13 High Sierra. If you are using a PC, then go for a reasonably speedy machine and relatively current model. Windows 7 Pro or Ultimate, Windows 8.1 or Windows 10 are compatible. The speed of the server makes a significant difference (see below). The speed of your client machines is also a key determinant of the responsiveness over an internal network (LAN) or an internet-based connection (WAN). The larger your network and number of nodes (computers and laptops + mobile devices) the more important it becomes that you use the faster devices. Makes sense. FileMaker.com breaks down all variations of requirements for FileMaker 16 on their Technical Specifications page. Make sure anyone who does lots of reporting in Studio Manager has a reasonably fast machine. We strongly recommend installing a fast SSD boot drive as the easiest and most economical way to improve performance of an existing computer. Knock on wood, so far we haven’t gotten a single complaint from a PC user. Expect Studio Manager to work as well on your PC as it does on a Mac! We are the first to admit that Studio Manager was built first for the Mac. But, FileMaker, Inc. has made the best cross-platform database around and we’ve carefully designed this product for cross-platform use. With the tiniest of exceptions (see next sentence), every feature of Studio Manager runs cross-platform. Because there are small differences in font metrics between platforms, you may run into a few minor font-wrap issues on some layouts (which you can easily correct) but the functionality is flawless. Because Studio Manager is built to run in FileMaker Pro, it is extensively customizable. Change the formatting of screens or fonts. Translate field labels into a different language. Adjust report layouts so they look like you printed them on your letterhead. Add additional reports and layouts. 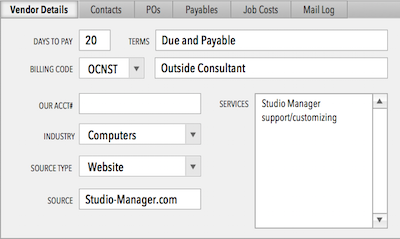 We are available to help you customize Studio Manager at our regular consulting rates. Because we built it, we are really good at changing it , but don’t feel for a minute that you are locked into working with us. As a Studio Manager customer, you have the ability to change anything in the product on your own or using a local FileMaker consultant of your choice. And, we are still very happy to help you, or your favorite consultant, if you get stuck or have a question. If you don’t already own copies of FileMaker Pro or you need to upgrade to a newer version, the expense can be significant – or not! Our advice. Call FileMaker, Inc. at 408 987-7000. Try FileMaker.com’s Buy button on their front page. Then shop around! We’ve been using StudioManager since 2002 or so, and I just came to your site to see if it was upgradeable. I’m glad it is, but really I’m writing because I’m impressed with this site and the friendly tone of the whole thing. Nice work! I just came across SM since, as one of the owners, I’ve been assigned a mission in my studio, that is to make this office grow as far as it gets, and I think SM can do a great job for us. We are spanish and were just wondering if there is such an spanish language version. I haven’t seen this on the web. In any case, my next question comes along: Is SM so customizable that we can be able to edit each and every text-box, frame, menu, etc. to make a translation of my own?